is it possible to specify that the strings in a file within the value-* directories are purposely not translated into other languages? I have a bunch of strings that are common for all the languages and need no translation, so I've created an unlocalized-strings.xml file within values directory.. Running Android Lint to check for problems it keeps saying that some translations are missing.. I do not want to disable this check on the whole project, I'd like to disable it only in some XML files.. is it possible? should also be translated in all other languages. How can defined this region of unlocalized strings? If you have a lot of resources that should not be translated, you can place them in a file named donottranslate.xml and lint will consider all of them non-translatable resources. You can add the prefix donottranslate- to your resource file. As in the previous example, lint will consider all of them non-translatable resources. In your case, you can replace unlocalized-strings.xml by donottranslate-strings.xml. It seems to work, but I haven't found any documentation for this tip. Create a resource file with a file name starting with "donottranslate" (e.g. donottranslate.xml, donottranslate_urls.xml, etc), and lint will ignore its strings altogether when checking for missing translations. 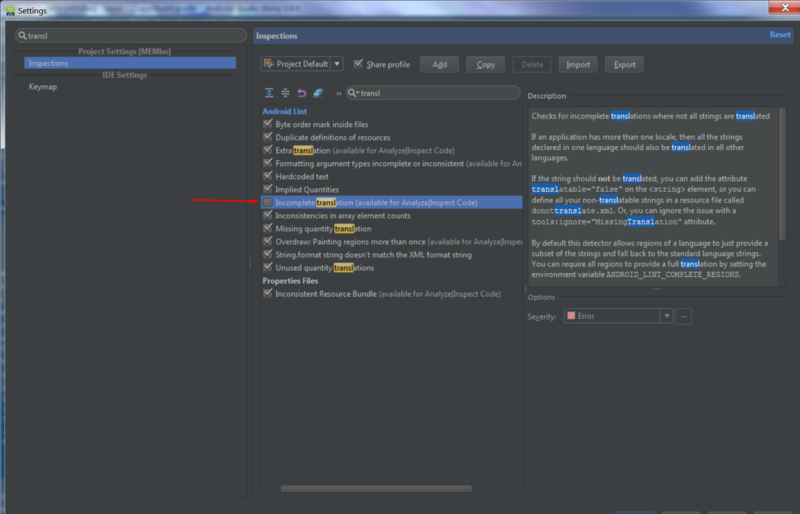 buildConfigField "string", "app_name1", "App Name"
resValue "string", "app_name2", "App Name"
To avoid warnings in Android Studio, open Preferences ==> Inspections, uncheck "Incomplete translations". But it won't affect Gradle build. There is also the "Translation editor - Edit translations for all locales in the translation editor." One can just check the 'Untranslatable' box on a string. Not the answer you're looking for? Browse other questions tagged android android-resources android-lint or ask your own question. How to sign APK on Android Studio even with non-translated strings? Android Lint: how to ignore missing translation warnings in a regional locale string file that purposely only overrides some default translations? Lint: How to ignore “<key> is not translated in <language>” errors?